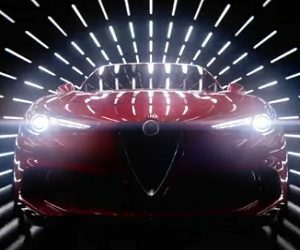 Alfa Romeo has released a new commercial, introducing the all-new Stelvio, the first SUV in its 106 years of history. The 60-second spot features a red Stelvio on Stelvio Pass, a mountain pass in northern Italy and the highest paved mountain pass in the Eastern Alps, whose immensity and grandeur inspired engineers and artisans to create a vehicle with a high level of performance and utility like Stelvio. “Done it, been there, drove that” – starts the song used in the ad, describing the images on the screen and continuing with “this is the state of our cars”. “Oh, damn, so glam, yes, ma’m, grand slam”, “Pure breed, dopamine to the head”, “OMG, SUV from Italy, 500HP”, “princess, red dress, hell, yes”, “pure power, rush hour”, “there we go, stole the show”, “say my name, Stelvio” – are some of the lyrics specially written for the ad.